Sacred Objects, Places, and People (Part 3 of 3) . . . The previous two posts discussed how people use objects and places as mediators whereby they may come in contact with the sacred world. In so doing, social harmony between the sacred world and secular world is maintained so that no harm or misfortune comes one’s way. Sacred people are the last of the three ways. Since I have been using the Ryukyuan Islands (between Japan and Taiwan) as examples, I will continue using that area of the world to illustrate. Sacred people are an integral part of the Ryukyu-Okinawan people’s animism and shamanism. Spirits are communicated with through the agency of the “yuta,” (one is seen to the right) whose role is performed almost exclusively by women. 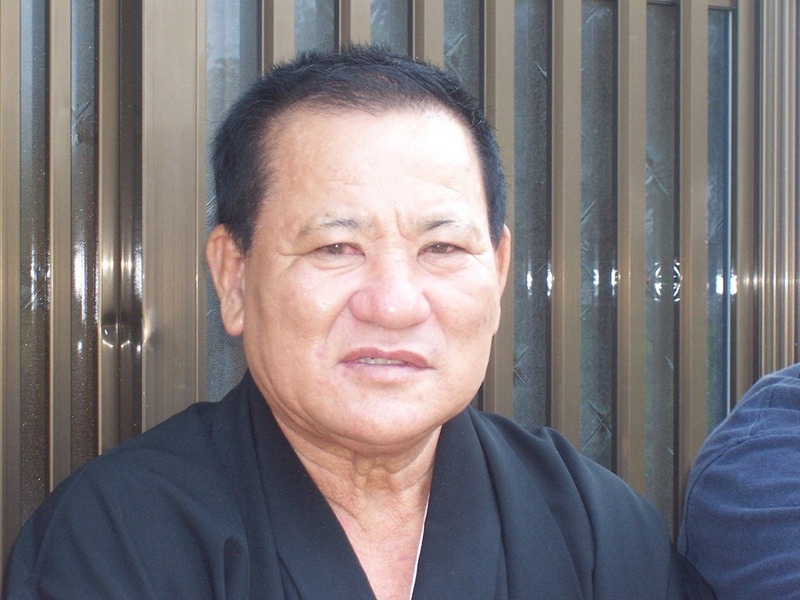 The yuta is an intermediary between the spirit world and those of the village. The world that can’t be seen is closely intertwined with the world of the living. The yuta has supernatural power to see, hear and discern the cause of misfortune and advise action to be taken. “Examples of problems for which they are consulted include ill health, dream analysis, suitability of marriage partner, matters related to the tomb, selection of a house site, economic hardships, and even politics. 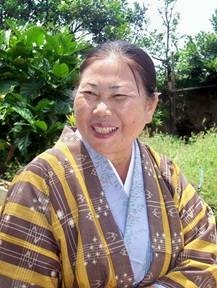 In Okinawa, where women have traditionally held the predominant role in religion, the yuta and her practices are deeply rooted in the social structure.” (Brief History: 2002) There are four categories of things that people go to yuta for. After a person dies, from one week to forty nine days of death, the family will ask yuta to come to their home and consult with the dead person to hear the yuigon (遺言) or the last wishes. Based on the lunar calendar (旧暦), on New Years, the yuta goes to the house to pray for the safety within the house, health, etc. Divination (うらない). If there is sickness in the family, among the animals, or if there is death, etc., people will go to the yuta to find out the reason. For example, there was a man whose stomach was bloated with water, and there were no medical causes. The family went to the yuta and she told the family that the urn that contained the bones was full of water and needed to have the holes unplugged. Since the family had made a conscious effort to maintain the grave, they did not think there was water in the urn, but it was true. After they had unplugged the holes and let the water out, the man’s stomach was no longer bloated. People believe that if a child stumbles and falls down, the spirit of the child departs from him (魂が抜ける). To restore the spirit, the yuta takes the clothes belonging to the child, rice for cleansing (あらいの米), and rice wine (お神酒) to the place where the incident happened. The yuta then chants something, which my informant did not know, and it brings the spirit back into the clothes. She then takes the clothes back to the house where the child is and does a ritual to transfer the spirit from the clothes to the child. As another example, there is a lady, a friend of my informant from Osaka, who had a child with a high fever. The doctor determined that there was no medical cause, so the family consulted a yuta. She told this family that there were ihais (tablets representing ancestors) under their family shinsu (しんす) altar and they need to to clean it up. This yuta had not been to this house before. When they did as the yuta directed them, the fever went away. Shamanism is popular and well-patronized in the Ryukyuan society which is part of one of the world’s most developed nations. Ryukyuan people move comfortably between modern science and shamanism for treatment and counsel. Women conduct and oversee religious affairs of the community. In ancient Okinawa, people believed that women instead of men possessed the power to sense, approach, draw spiritual power and communicate with gods. In this belief, women are considered spiritually superior than men. They possess the ability to provide spiritual protection over their male siblings. Thus there is a belief in women’s predominance over men in various religious rituals. For instance, I was invited to a harvest festival on Miyako-erabu, around a one hour plus plane trip south of Okinawa. The spiritual priests and yuta consisted of three women and three men. One priest (seen to the left) asked me an unusual question, “What island are you from?” From his worldview perspective the world consisted of islands. In conversation with him, I discovered that he had never traveled outside the surrounding islands and so for him was a collection of islands. Basically, the three men priest only assisted in the festival and the women yuta were the only ones allowed to approach the most sacred places. The role of women in rituals or festivals practiced is pronounced and exclusive. Rituals held in utaki (the sacred groves protecting the community) are overseen by a group of women. Men are prohibited to approach this spot, participate only as assistants in these functions and are limited to serving sacred liquor to priestesses. Women are considered to stand closer to gods and possess the ability to sense spiritual power. Their spiritual power plays a large and central role in religious activities. Throughout the world, people rely upon sacred object, sacred places, and sacred people in order to maintain social harmony between this world and the other world. In so doing, no misfortune will come their way. Instead, they will receive blessings and peace in this life. The author of Hebrews (Hebrews 9-10) speaks of old testament worship. The people relied upon sacred objects (see Hebrews 9:1-6), sacred places (the temple), and sacred people (the priests and high priests) as means for entering the Holy of Holies, the most sacred place. In a real sense, each one served as mediators and advocates between the secular and sacred. The author then reveals that Jesus is now the only mediator (Hebrews 10:19-20). When I think of this truth, concerning Jesus Christ as the one and only mediator, and also how people live life on earth, I am thankful for my spiritual heritage. However, I also stand humbly before the Lord knowing that it is my responsibility as His ambassador (II Corinthians 5:20) to proclaim this simple message of what, where, and who is the true mediator between the sacred and the secular.